Halong Bay Vietnam appeared impressive in Indochina film ( Vietnamese: Indochina) won the Oscar for Best film speaking in foreign language in 2013. Camera must be on top of the things you should bring for every trip, not only Halong bay tours! You don’t want to wait any moments in front of the amazing landscapes. Terminal area of Tuan Chau International passenger Port extensively meets the needs of thousands of parked vehicles. Adventure holidays are a way to explore the world around you, without trawling malls, staying in luxury cruise & having endless massages at a spa. Vietnam is such a majestic part of Southeast Asia and Halong Bay is truly the jewel in its crown. Halong city is surprisingly beautiful from Queen Slings! Halong smile and sales culture in Halong Night Market. Hanoi was voted as the world's best destinations for cheap travel. The Capital of Vietnam - Hanoi - at the top of least expensive destinations in the world, travel sites TripAdvisor has announced. Impression up-coming Carnival Halong 2015 Festival. There are 4 main parts included in the Carnival Halong 2015, namely opening ceremony, art performances on stage, parade and fireworks. International cruise ship "broke ground" Hon Gai Port. Luxury Golf course on the banks of Halong Bay. More than 20,000 tourists arrived to Ha Long Beach on April 30. The number of tourists travelling to Halong rocketed in April 30. The most beautiful time for visiting Co To Island is the summer, from April to September, 3D2N tours only costs about 1,200,000 VND / person. Quan Lan-the pearl of the ocean. The beauty of Quan Lan island, a beautiful island of Ha Long Bay area. This scenery is irresistibly stunning and attractive to all the tourists coming to that island. Quang Ninh welcomes more than 100,000 tourists in national holiday. Sakura festival 2015 in Halong bay. Quang Ninh province and Halong city honorably co-organize the Sakura festival 2015. Stories behind the name of Halong bay. Halong bay is a common place in Vietnam. However, the name behind it is still a myth. Halong bay Vietnam is famous for the nature beauty. Halong Bay marvelous seascapes, the pround of Vietnam. The top 5 famous cuisines in Halong bay. 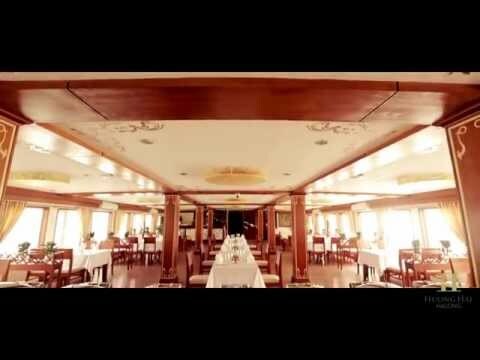 The stunning Halong bay cuisines which turn your Halong bay cruise tours more vivid. Top 5 most beautiful islands and islets in Halong bay. Among all the islands in Halong, some stand out to be the most beautiful islands and islets. Welcome to Bai Tu Long Bay ! Why should be Bai Tu Long bay? why you should backpack to travel when young? If the West Lake is a day cruise trip, but on a Halong bay cruise tour, you have 2 choice for day tours and overnight tours on the bay!